You are here: Home / Arts / Footloose The Musical at the Chemainus Theatre Festival. A review. 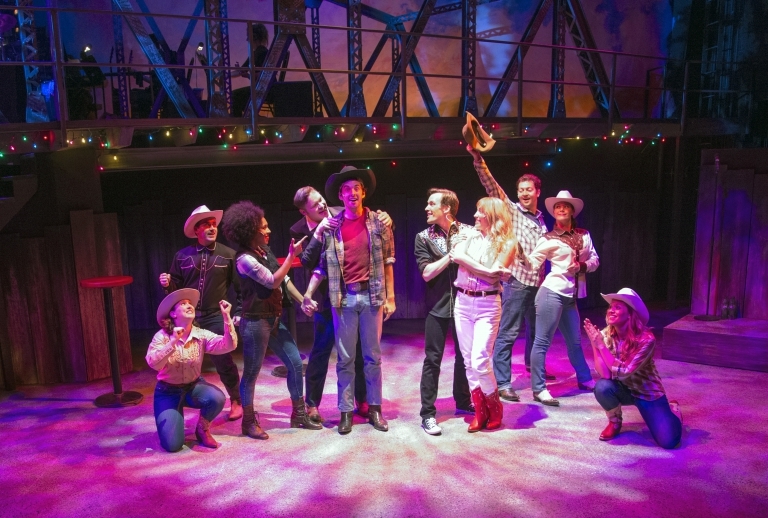 Drawing upon timeless themes and buoyed by hit music from the 1984 film, Footloose at the Chemainus Theatre Festival (June 10-August 27, 2016) presents a feel-good exploration of family and inter-generational skirmishes. When Ren McCormack (Justin Stadnyk) and his mom Ethel (Sarah Carlé) are forced to leave the big city for small town Bomont, the adjustments to their lifestyle are significant. Living with Ethel’s sister Lulu (Emily Henney) and her husband Wes (Kevin Michael Cripps) they slowly integrate into the social and school life of the community where the Reverend Shaw Moore (Andrew Wheeler in a compelling and nuanced performance) dominates. As the new kid on the block, Ren learns quickly that his love of dancing (I Can’t Stand Still) is forbidden, makes friends with loveable goofball Willard (Nathan Kay) and falls for the preacher’s daughter, rebellious Ariel (Kaleigh Gorka), while trying to fend off his nemesis, her boyfriend Chuck (Stuart Barkley). Lauchlin Johnston’s ingenious and compact set incorporates the girders and beams of the Potawney Bridge, site of a fatal accident that claimed the lives of four teenagers, in a stylistic reference to the tragedy whose undercurrents are played out daily in the lives of the townspeople—young and old. Rather than employ a revolve, Johnston makes use of wheeled design elements to create the many different locations—pews for the church (Narda McCarroll’s lighting effects flood the space as if through clerestory windows), lockers for the school, barrels for the boys’ hang out, and in a nod to quirky 1950s fashion—turquoise and pink tables and chairs for The Burger Blast. Costumes (Catherine Hahn) reflect 1980s sensibilities with short flirty skirts and leggings, elements of glitter, skinny ties and tight pants for the youth, and colourful jackets for the adults. Big hair makes a comeback too, as do crinolines for dresses worn during the dance. With actors in multiple roles, costuming is essential in helping the audience differentiate between characters. The resulting quick changes (over 40) definitely keep the back stage crew (Angela Beaulieu, Liz King, Koh McRadu) alert. Kaleigh Gorka, Jarret Coday, Makayla Moore, and Jocelyn Gauthier. Photo Cim McDonald. With music that draws from rock and roll, R&B, pop, gospel and Broadway, it’s easy to see why Footloose has remained popular since the film first appeared in 1984 (the soundtrack sold over 8 million copies and five of the original tracks were hit singles including the title number *). The ensemble navigates skillfully between high energy (Footloose, I Can’t Stand Still, Holding Out For A Hero, Let’s Hear it for the Boy, Still Rockin’), contemplative (On Any Sunday, Learning to be Silent, Heaven Help Me) and romantic (Almost Paradise) numbers. Director Barbara Tomasic (in her Chemainus debut) subtly touches upon the many struggles faced by youth and adults alike–Cailin Stadnyk and Sarah Carlé are masterfully restrained in Learning to Be Silent, Somebody’s Eyes (with Jocelyn Gauthier as Urleen, Marisa Gold as Rusty and Emily Henney as Wendy Joe) simmers with mean-spirited vindictiveness, and Andrew Wheeler shows the uncertainty underneath his hard exterior in Heaven Help Me. Ensemble numbers (I’m Free, Footloose) abound with energy and deft choreography (Julie Tomaino) including crowd-pleasing flips, jumps and spins. The tempo shifts to country bar regulars line-dancing in Still Rockin’ where Willard makes a spectacle of himself learning to dance, and Sarah Carlé amuses as a clutzy Betty Blast (Holding Out for A Hero). Fine vocal harmonies are evident in Mama Says as Willard elaborates on his mother’s home-spun philosophy to his buddies (Scott Augustine—Jeter, Jarret Cody—Bickle, and Ren); elsewhere the boys lay down a cool rap in Dancing is Not A Crime. Let’s Hear it for the Boy (Jocelyn Gauthier, Marisa Gold Kaleigh Gorka, Emily Henney) gets a rousing R&B interpretation that is a powerful reminder of its enduring hit status while Almost Paradise (Kaleigh Gorka and Justin Stadnyk) takes the audience back to aching romances of youth. Musicians (Brad Shipley, Marisha Devoin, Alicia Murray), under the direction of Nico Rhodes, propel the action onstage. 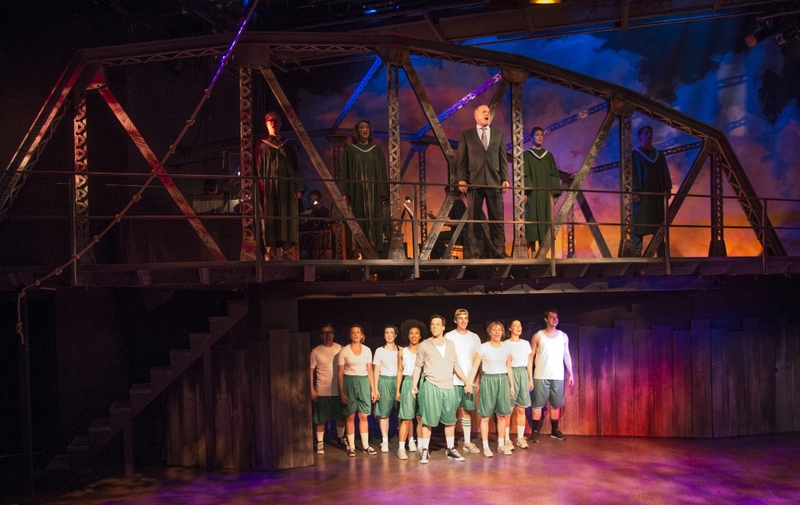 Love prevails; as differences are resolved and Reverend Moore’s grip loosens, the town erupts into a joyous celebration that had the theatre on its feet, laughing and clapping along. Disclaimer: We attended Footloose as guests of the Chemainus Theatre Festival and the Playbill Restaurant.